Groentesoep met Balletjes is a typical Dutch Vegetable Soup. Literary translated Vegetable soup with balls. Didn’t realize that it’s a typical Dutch dish until I noticed I didn’t see it over here (USA). This is my version of groentesoep met balletjes. 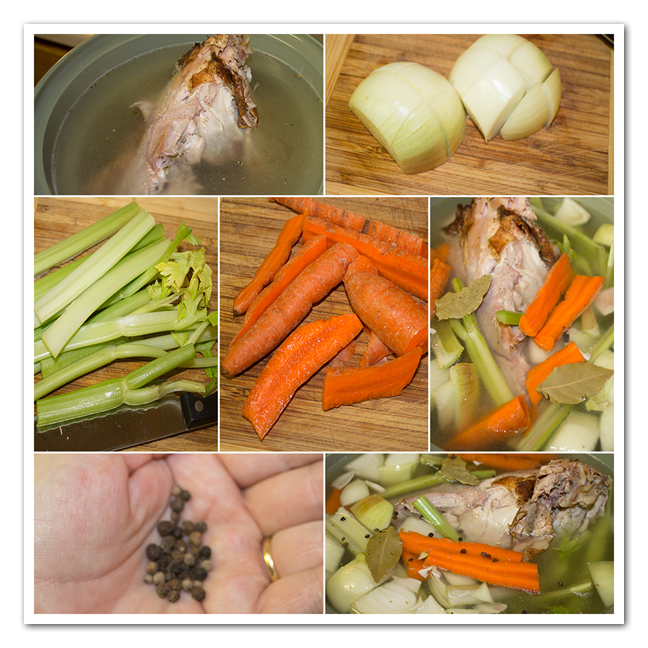 Put the carcass in the slow cooker and fill with water. Cut up the onion, celery, carrot in big chunks. Add all to the slowcooker. Add the peppercorns and bay leaves. Put on low for at least 8 hours. (I did overnight). 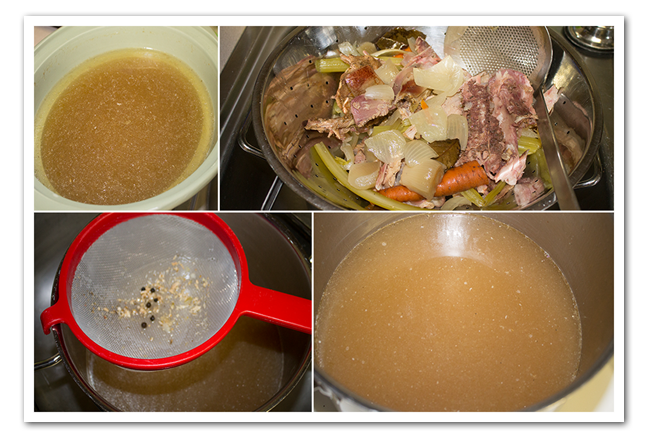 Next day take all the vegetables and the carcass out of the broth. Use a sieve to make sure you there are no solids left. Now you can freeze the broth or use it for this soup. Time to make the small meatballs. Mine are a bit big, next time have to make them smaller ;). Break up the bread, add enough milk to saturate the bread. Squeeze some milk out of the bread, put 1 egg, ½ cup of bread crumbs, minced onion and seasonings to the ground beef/pork, optional add fresh parsley to the ground meat. Mix all together and make some meatballs. Make sure you make them small, you noticed I didn’t ;). Cut the leek length wise and then cross wise so you have small pieces, rinse with water. All vegetables needs to be of uniform size. 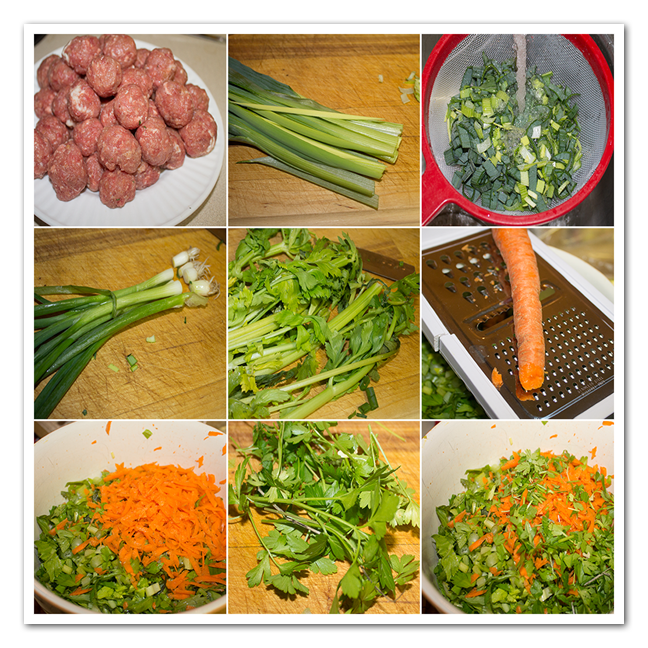 Cut the green onions, chop the celery leaves and shred the carrot. Chop the parsley. 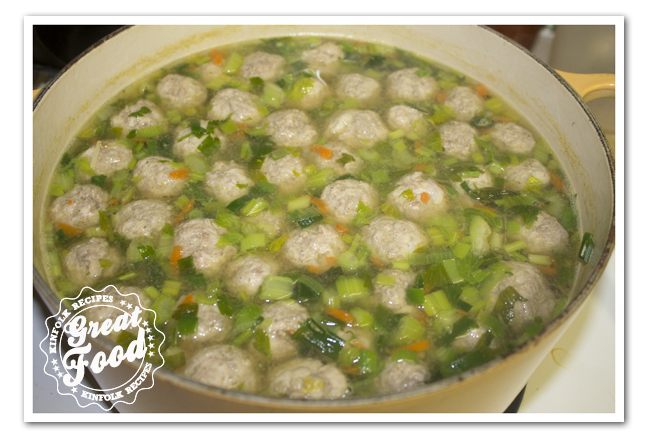 Add the meatballs to the broth, they are done when they float to the top. 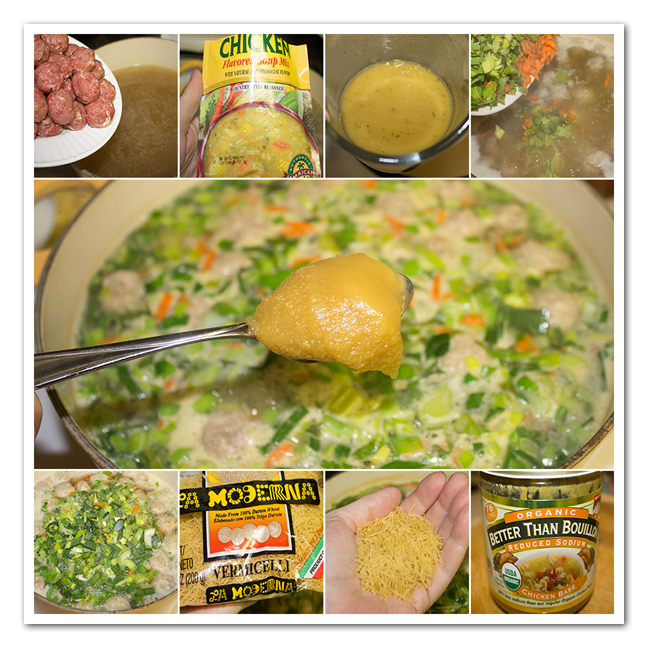 Add the soup package of your choice to the broth. I found this one in the ethnic section you don’t have to use this one you can use Knorr to. Add the chopped vegetables, the vermicelli (found that also in the ethnic section) and 1 tbsp of better then bouillon. Cook for about 20 minutes. Groentesoep met Balletjes is a typical Dutch Soup. Literary translated Vegetable soup with balls. Didn’t realize that it’s a typical Dutch dish until I noticed I didn’t see it over here (USA). This is my version of groentesoep met balletjes. Time to make the small meatballs. Mine are a bit big, next time have to make them smaller ;). Break up the bread, add enough milk to saturate the bread. Squeeze some milk out of the bread, put 1 egg, ½ cup of bread crumbs, minced onion and seasonings to the ground beef/pork, optional add fresh parsley to the ground meat. 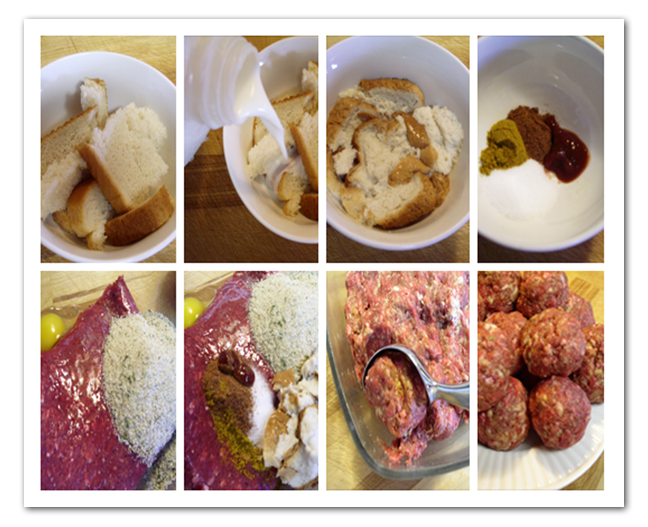 Mix all together and make some meatballs. Make sure you make them small, you noticed I didn't lol. 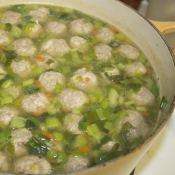 Add the meatballs to the broth, they are done when they float to the top. Add the soup package of your choice to the broth. I found this one in the ethnic section you don't have to use this one you can use Knorr to. Add the chopped vegetables, the vermicelli (found that also in the ethnic section) and 1 tbsp of better then bouillon. Cook for about 20 minutes.